The Acura MDX offers an outstanding V6 powertrain, seven-passenger seating and a standard four-wheel-drive system that prevents skids almost before they happen. Neat styling, attention to detail, excellent crash protection and competitive pricing increase the appeal of this luxury SUV. Introduced in 2001, MDX was named North American Truck of the Year by a panel of 50 independent automotive journalists. Through the four model years since, the MDX has been steadily improved in all areas. The body has grown more rigid, allowing better vibration control and a smoother ride. Power has increased, and a more compact five-speed automatic transmission shifts even more smoothly than before. MDX's standard VTM-4 four-wheel drive system has been remapped to work seamlessly with a new Vehicle Stability Assist (VSA) system to improve handling on slippery surfaces and to enhance stability in all conditions. Acura has updated the optional navigation system and added a rearview camera that engages when the transmission is in reverse. A DVD entertainment system with wireless infrared headphones is now available. For 2004, MDX gets another round of updates. This is what the auto industry calls a mid-cycle revision, and the improvements are as extensive as any undertaken so far. Horsepower and torque increase, thanks to a new dual-exhaust system. The 2004 MDX sports new front- and rear-end styling, redesigned alloy wheels, a new Side Curtain Airbag system that helps to protect occupants in all three rows, and interior upgrades that include enhanced interior lighting with ambient footlights and entry illumination. In short, the attributes that earned MDX awards remain and have been refined. This so-called luxury SUV remains one of the best values in the class. The MDX is an Acura, so it follows the brand's all-inclusive price strategy, with limited options. It's offered in a single trim level, powered by a 3.5-liter, 265-hp V6 mated to a five-speed automatic transmission. MDX ($36,400) comes standard with a long list of luxury and convenience features, including many that are extra-cost options on its competitors: leather seating surfaces and leather door inserts; keyless remote entry; power windows, door locks and mirrors; power tilt-and-slide moonroof; cruise control; seven-speaker AM/FM/cassette stereo with in-dash CD player; power adjustable front seats; alloy wheels and a multi-function digital trip computer. For 2004, there's also a standard tire pressure monitoring system that uses sensors in the valve stem of each wheel to alert the driver when tire pressure drops significantly below the recommended level. Even with a host of improvements, 2004 MDX prices reflect a modest price increase of $700, or less than 2 percent compared to 2003. Prices for the three options offered have not changed. 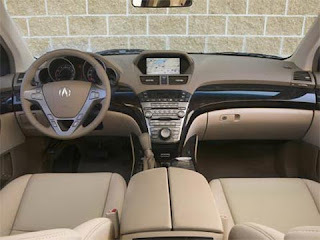 The Touring package ($2600) adds a killer 200-watt, eight-speaker Acura/Bose music system with in-dash six-disc CD changer; a keyless remote linked to the two-position driver's seat and mirror memory system; eight-way adjustable passenger seat; roof rack; an outside mirror that tilts to track progress while backing up; rain-sensing windshield wipers and special alloy wheels. Acura's DVD Entertainment System ($1500) for rear-seat passengers adds a seven-inch widescreen display that flips down from the ceiling at the push of a button. The system comes complete with two infrared (IR) wireless headphones and a wireless remote control. Kids dig it. The DVD-based Navigation System ($2200) needs only one disc to cover the entire continental U.S. Recent enhancements include voice recognition and upgraded graphics. The system includes a rearview camera that transmits pictures from behind the vehicle onto the navigation screen when the MDX is in reverse gear, but it can only be ordered with the Touring package.